These vats were retrieved from storage the day prior to the wash by the boys of the village. Usually these vats measured about 60 inches in diameter and were constructed in solid oak using the same techniques as were used in barrel making. The ashes were gathered by all the families in the village, each of whom kept a receptacle next to their fireplace and for months had been saving their ashes. The boys would then sift the ashes to separate out the finest part, a white and silky powder that they then put into a bag. They would fill the vat first with rye straw and place the bag full of ash on top. The following day at daybreak the laundresses would arrive. 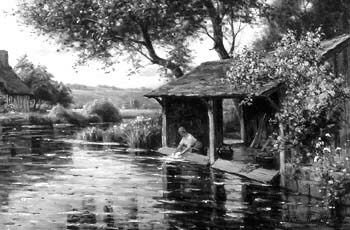 The men of the village brought the linens to be washed to the lavoir. The first step was to remove the surface dirt, a long and arduous job done with soap, brushes, and lots of fresh water. The laundresses arrived, each equipped with her “aquerno,” a wooden box on which she kneeled, as well as her bat to beat the linen. The atmosphere was generally joyful and it was a festive day when everyone from the village arrived to work together. Enormous basins full of water and ash were then put on the fire and the linens that had already been cleaned of their surface dirt were piled in the basins of boiling water. The boiling freed potassium salts that were in the ashs and this is how the “bue” was begun. After one hour the water was drained by turning the valve at the bottom of the vat. The soapy and somewhat greasy water was then reheated and poured once more into the same vat. There, the linens would soak for three more hours. This same process was again repeated in order to soak the linens for one whole night in hot water. The following day, the linens were removed from the vat and wrung out. The men from the village brought them to the river to rinse in clear running water. Ready to be dried, the linens were thus lain in open fields so that the sun and wind could then dry and bleach them. It was not uncommon that each family had his or her personal recipe for a scent with which to perfume their linens – it must not be forgotten that these textiles were not only the pride and joy of the family but much of their personal wealth as well! And not surprisingly so, in the Middle Ages the secret recipe of each woman’s laundering perfume was also one of the secret recipes with which she kept her husband….